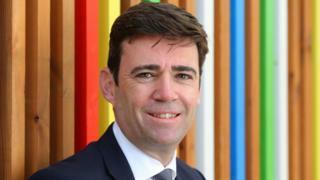 Mayor of Greater Manchester Andy Burnham said such health inequalities were “scandalous in 2018”. The BBC’s Shared Data Unit analysed data from the Office for National Statistics with deprivation data for local authority areas in England and Wales, as well as comparable data for Scotland and Northern Ireland. 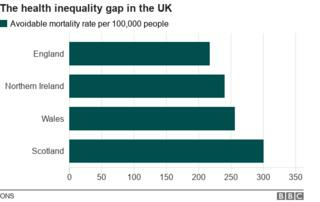 Mr Burnham said the findings were a “stark reminder of the huge health inequalities that exist between the north and south of England”. In England – Chiltern, South Oxfordshire, South Cambridgeshire and Hart in Hampshire had the lowest avoidable death rates. Places with the highest rates include Manchester, Blackpool, Middlesbrough, Hull and Liverpool. 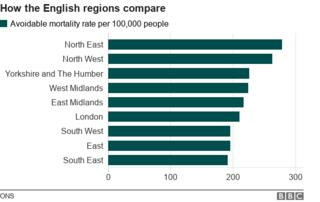 Figures released on Wednesday showed Hull also had the highest overall mortality rate in England and Wales, with 1,346 deaths per 100,000 people in 2017. The city replaced Blackpool as having the highest mortality rate. What is an avoidable death? Deaths in people under 75 from heart disease, some cancers, respiratory conditions and type 2 diabetes are among those classed as avoidable. The list dates back to the 1970s when it was drawn up to help develop effective healthcare. The Department of Health and Social Care (DoH) said more than £16bn was being invested in local government services to tackle public health issues in addition to free NHS health checks and screening programmes. It also offers a free flu vaccination programme, a national diabetes prevention programme, a childhood obesity plan and a tobacco control plan. Belfast father-of-six Gerard O’Neill says he doesn’t know where he would be if he had not been referred to one of the city’s healthy living centres. 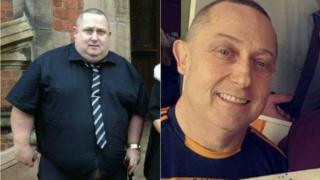 Mr O’Neill has lost 12 stone in two years after receiving help from the Maureen Sheehan Centre in West Belfast. The 55-year-old former fisheries officer was initially referred on a 12-week Healthwise plan by his GP after his weight ballooned while caring for his elderly mother as she battled dementia. However, following his mother’s death he decided he had “to do something” about his health and went to see his GP who referred him to the Maureen Sheehan Centre which has a small gym. Through healthy eating and regular exercise, however, his weight dropped to about 15 stone – and he has even completed two 5k charity walks to raise money and awareness of Alzheimer’s. Not content to stop there – he has also rekindled a passion for handball and now coaches a youth team. He has also completed a training course to rehabilitate cancer and heart attack survivors. “It’s great to return something back,” he said. The highest rate was found in Merthyr Tydfil (319 per 100,000 people), the second most deprived area in Wales; while Monmouthshire – the least deprived – had the lowest rate at 198. Dr Chrissie Pickin, from Public Health Wales, said improvements had been made with heart disease through a reduction in smoking, but cases of liver disease, mental illness and substance misuse had risen. Labour’s Merthyr Tydfil and Rhymney MP Gerald Jones said the Welsh Government had pumped significant funds into public health over the last 20 years but given the history of heavy industry in areas like Merthyr Tydfil there was a higher incidence of long-term illness. The avoidable death rate varied from 373 deaths per 100,000 in North Ayrshire, where there are high levels of deprivation, to 185 per 100,000 in Shetland. A spokesman for North Ayrshire Health and Social Care Partnership said avoidable mortality was “inextricably linked to higher levels of deprivation”. He said the most important course of action was to work with the Scottish Government to bring investment and jobs to the area. 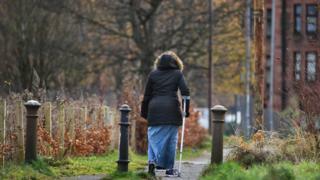 The Department of Health in Northern Ireland said reducing inequalities was a “huge challenge”. To help change this trend the agency has invested in organisations which deliver health and wellbeing programmes – particularly in communities with high deprivation. Among them are The Heart Project, which offers rehabilitation to people in Belfast who have suffered heart attacks or strokes, and a network of healthy living centres based in areas of high health inequalities. The Shared Data Unit makes data journalism available to news organisations across the media industry, as part of a partnership between the BBC and the News Media Association. This piece of content was produced by local newspaper journalists working alongside BBC staff.